Finding public beach access on Treasure Island really isn't much of a treasure hunt. 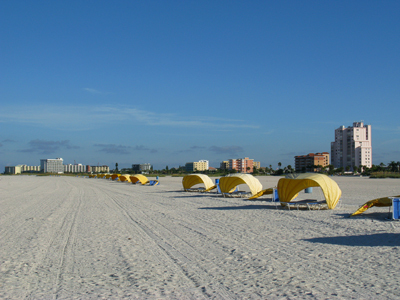 Gulf Blvd is the only north-south road running parallel to the beautiful wide beach and the parking lots are all west of it. This is not my favorite lot (and I'll tell you why in a minute) but it is the first one you come to when crossing John's Pass from Madeira Beach to the north. There are no picnic or restroom facilities, the enormously wide beach your previously read about is NOT here (you just have to walk a couple minutes south, though), and it is close enough to the John's Pass jetty that it attracts idiots who pile themselves up on the rocks or get themselves in a strong current and play chicken with big fishing boats going in and out of the Pass. 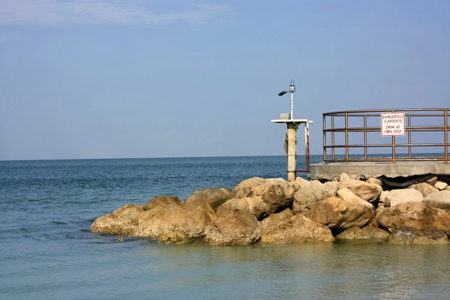 Don't even think of getting in the water near this jetty. Big rocks hurt when you get smashed against them and you'd break your ribs trying to climb out over them. Plus, there are probably a million fish hooks snagged and lost on those rocks. Is it really worth it to swim near that place? Just north of the intersection of Central Avenue (107th Ave in Treasure Island) and Gulf Blvd is a big paved parking lot with strictly enforced pay stations. The exact location is 112th Avenue. Here's where you enter the enormously wide beach. You'll go through a structured entrance and the expanse of white sand will open up in front of you. Get ready...it is huge. The sand here has been "renourished"...meaning it's been pumped from offshore and hauled in by barge to replace the nicer powdery white sand that has been lost through nature. You'll find lots of small broken and crushed shells in the mix. It doesn't really bother me, but some white sand purists might stick up their nose at it. Big deal. The beach is beautiful...and VERY far away from traffic noises. 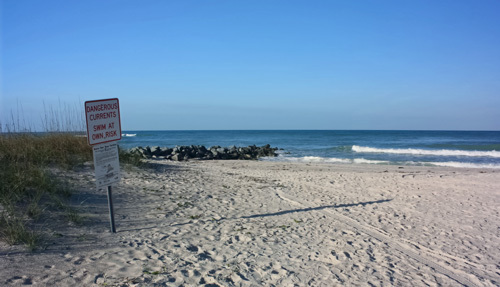 This public beach access area has a snack bar, restrooms, picnic tables, and a cool playground for children. You can also rent cabanas and chairs up here. The city does a great job of keeping this location clean. The sand is raked regularly by a big tractor and the water is outstanding. Just be aware that most people crowd this area down by the beach during high use days/seasons...but walk a couple minutes either direction and you'll pretty much be by yourself. This where I used to park everyday...when it was free. Now it costs a couple of bucks an hour. Gulf View park has an Old Florida flavor when you enter the beach over a sea oats covered sand dune. A beautiful setting that puts you in a great mood to relax. It's located a few hundred yards south of The Bilmar Resort (which houses the great beach bar called "Sloppy Joe's") on 104th Avenue. The parking lot is pretty big, but people who drive are smart and it fills up pretty quick by noon at the latest. I like to get here close to 8:00 AM and leave by that time. 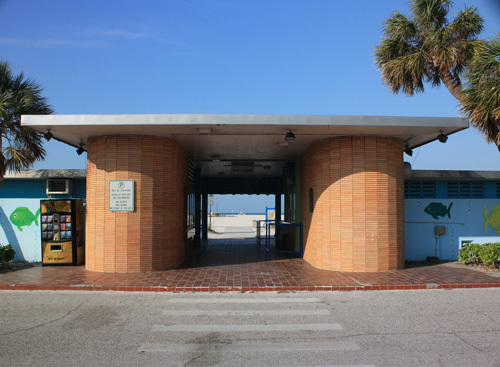 There are no covered picnic areas, but there are clean restrooms, benches, and showers at this well-maintained entrance. Two boardwalk bridges take you over the dune. Another nice feature is the sidewalk which runs north-south for about a mile at the entrance. You'll meet all kinds of friendly people out here for a walk. You get the full perspective of a super-wide beach here. There is room for kite-flying, playing catch with a frisbee or baseball, running on the hard-packed white sand behind the cabanas, or just walking along the water's edge. Don't try to pull a fast one and catch a quick nap. You do not want to explain to the Treasure Island Police Beach Patrol why the cabana guy is upset. Trust me, they have heard it all. If you aren't paying attention, you'll drive right by this little place. Camouflaged between two motels is this unpaved, little spot. Up until 2017, it was FREE. Not anymore. Unbelievable. There are about 20 spaces...depending on how people wedge in here. This is a tough place to park if your drive a pickup, or a large SUV. There is no space to turn around, so you have to back out onto Gulf Blvd. The city did not think this through very well. The last time I went there, it was $2.00 per hour. It may be a little more, now. A nice little boardwalk bridge takes you over a well-maintained dune with nice vegetation. The beach is usually wide and empty. There are no facilities, but it's only a block or so from Gulf View Park to the north. This little paved lot is squeezed in between a couple of condominiums and requires you to feed Quarters to a meter. It's located about where 100th Avenue would be on Gulf Blvd. 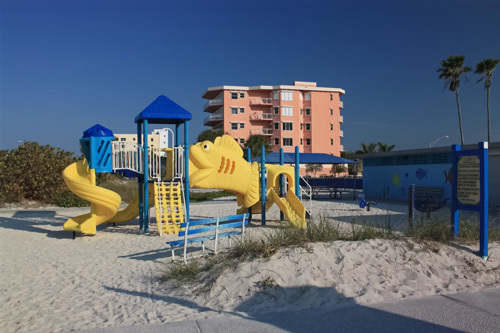 When you get to the north edge of Island Inn Beach Resort Condominium, you'll see it. You'll cross a boardwalk bridge onto a huge expanse of beach. There are no facilities of any kind. Not many folks frequent this nice stretch. I love it. This tiny little metered (feed me Quarters) lot is located on what is known as Sunset Beach. It's a very nice, clean, quiet little community that is densely populated with retirees and professional people. 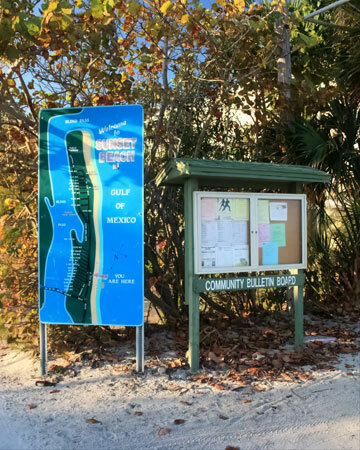 To find the public beach access at Brown Pelican Lot, stay on the west fork of Gulf Blvd and go south of Caddy's on the Beach Restaurant (a GREAT place) and across from the rowdy Ka'Tiki beach bar. Well here we combine Old Florida (an unpaved lot) with New Florida (over 60 parking meters that gobble Quarters) on Sunset Beach. This lot is south of The Brown Pelican Lot on the west fork of Gulf Blvd. It's about at 81st Avenue. You'll see real tall Australian Pines just north of the dune boardwalk. They form a nice screen between the condo complexes and the quiet beach. When a storm out at sea is churning up bigger waves you'll see the local surfers out here. 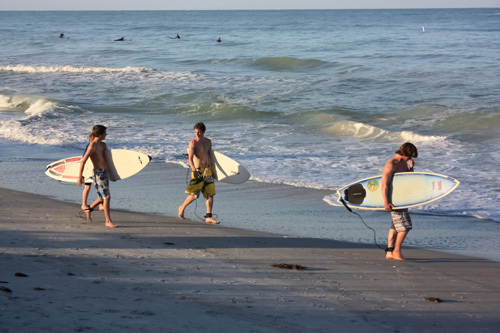 The residents in this laid-back community, as well as the locals who surf at Sunset Beach, are becoming increasingly edgy with out-of-town visitors...and with good reason. It seems like each Spring Break brings in more obnoxious young people who litter yards with beer bottles, urinate wherever they please, and physically threaten the neighborhood retirees. It is no wonder the people who live and surf here are ultra-protective of this little slice of Paradise. If you choose to use this nice stretch of beach, please do so in a quiet and unassuming manner. Pick up any trash you see blowing around or beer cans in the parking lot...even if they are not yours. Trust me, the Pinellas County Sheriff and the Treasure Island Police Dept are on speed-dial here. 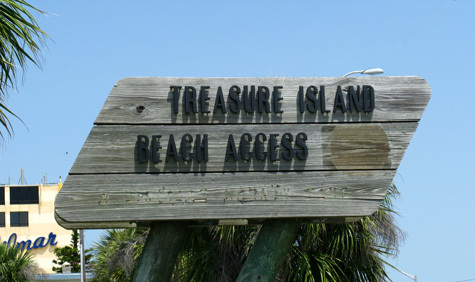 Return to Treasure Island FL main page from Public Beach Access Treasure Island FL page. This is a great book. 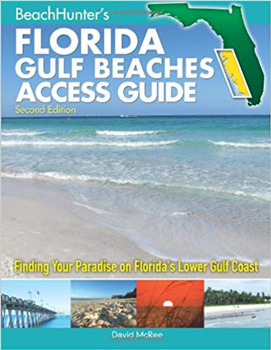 Full of detailed info on Florida's Gulf Coast Beach Access.